You come to the tiny and incredibly remote town of Exmouth for one reason, and one reason only. To get onto the spectacular Ningaloo Reef – a reef that some people rate as highly as the Great Barrier Reef on the other side of Australia. 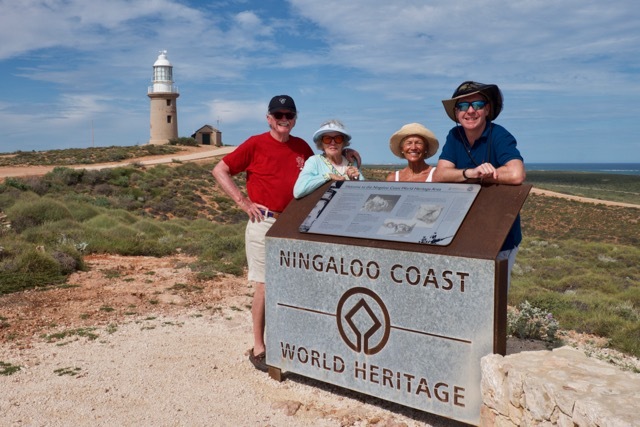 What makes the Ningaloo so great is both its accessibility and its inaccessibility. If you're in the area, you can just wade straight out to it from the beach (and these are some spectacular beaches). 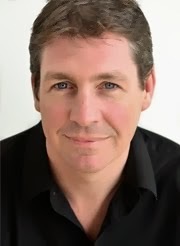 But, the key point is that you have to be in the area – this is an incredibly remote spot, one that's not near any population centres or international airports, which means that there's just not the same crowds as you find in places like Cairns or Airlie Beach. 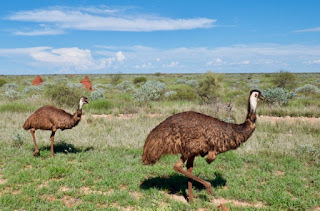 Exmouth itself only has a population of 2,500 people, and on a Sunday morning it was positively comatose – about the only life we saw on the streets was a family of emus wandering down the main road like they owned it. To confirm that we were visiting out of season, even the town's main landmark, "The Giant Prawn" (a 4 metre high fibre glass prawn that oh-so-tastefully commemorates the town's prawn fishing industry) had been taken down in case a cyclone blew in. It did make you wonder who could live in a town like this – it's incredibly hot, peopled by hundreds of annoying flies per capita, surrounded by a red and dusty, arid landscape, and seemingly with very little going on. But, to confound my ideas of what constitutes a desirable place to live, we saw that the marina has undergone a multi-million dollar development, and rows of upmarket holiday homes were now being built on the water. 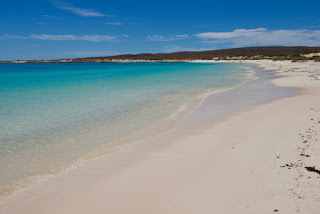 Because, what's attracting all these people here is the wonderful Ningaloo Reef – a haven for fishermen, divers, snorkelers and glass bottom boaters. 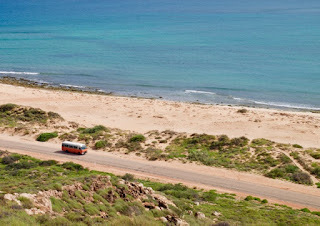 So, today we hired a 4x4 and set off for the Cape Range National Park, so that we could get into the water. After stopping off at the Vlamingh Head Lighthouse (obviously named after one of my distant seafaring ancestors) for an overview of the peninsula, we headed into the park proper. 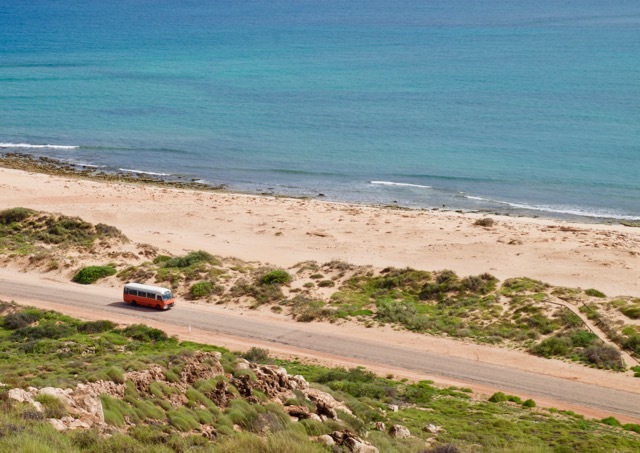 There were scarcely any cars at all on the long straight road - with the rugged Cape Ranges on one side and the Indian Ocean on the other, it all felt like a real adventure. 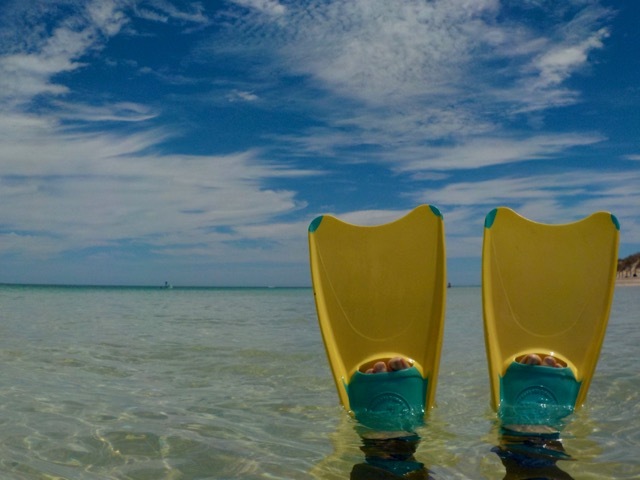 After picking up flippers and information from the Info Centre, we headed first to the beautiful Turquoise Bay for a snorkel. 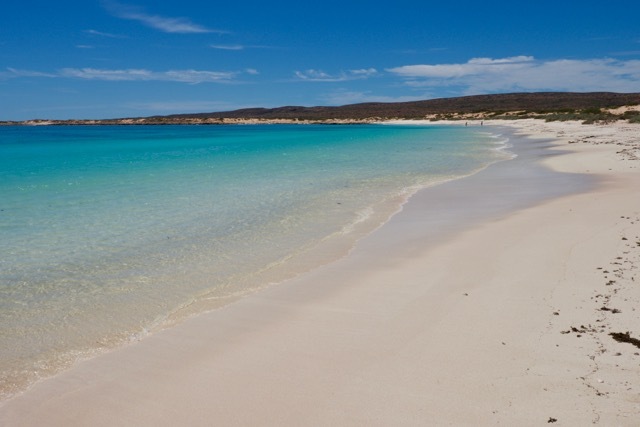 This idyllic place is rated in the Top 20 Beaches in the World by TripAdvisor, and you could see why – it was gorgeous. Soft white sand, incredibly blue sea, bath-like waters, and excellent snorkelling. Actually, there's quite a strong current there, so you have to walk along the beach to one end, and follow the current that runs down the beach. 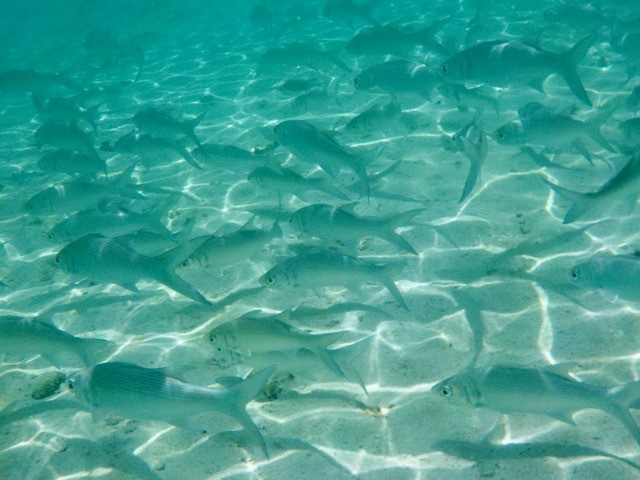 The coral wasn't too colourful, but it was healthy and there were plenty of fish down there. We had an alfresco picnic on the beach (with supplies picked up in the town's supermarket) – if you could ignore the extreme heat and could manage not to inhale a few flies with every mouthful, there couldn't be many more picturesque places to be eating. We then went round to the other side of the bay for a dip – there weren't any fish here, but there weren't any currents, and it was even more idyllic looking. As we floated about in the warm waters, chatting and laughing with the locals, it felt like we were in paradise. Our next stop was at Oyster Shacks, where the coral garden was accessible at high tide. There wasn't a sandy beacj here and it was more difficult to get into the water, but once you were in the water the snorkelling was really excellent – even more coral, and plenty of fish. 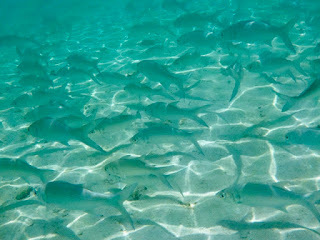 Swimming through a shoal of at least 50 large, brightly coloured parrot fish, munching on the coral, was the highlight. 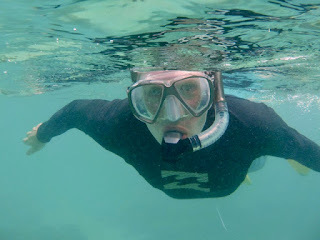 On our way back to Exmouth, we popped into Bundegi Beach for another soak – on this side of the peninsula the waters were even warmer (almost too warm), but the water was murkier and the reef too far to swim out to safely. We had packed as much as we could into our day in Exmouth, and we had a thoroughly enjoyable time. It helped that we had great company who supplied plenty of laughter along the way, but the reef and the landscapes were wonderful to behold. I won't be buying my holiday home in Exmouth just yet, but it was great for a day trip.